Salma Hayek is receiving quite an honor. On Sunday, the 45-year-old actress was one of the recipients named by President Nicolas Sarkozy to the Legion of Honor, People magazine reports. She’ll enter the honor academy as a Chevalier, or Knight. The “Puss in Boots” star, who is married to French businessman Francois-Henri Pinault, will be recognized at a formal induction ceremony. A source tells People mag the event will likely happen over the next two months at the Elysee Palace and will include a Presidential medal pinning. Women’s Wear Daily reports that Hayek’s father-in-law, Francois Pinault, was named a Grand Officer of the Legion of Honor, the country’s highest civilian decoration. The Legion of Honor was created as a merit award to acknowledge military personnel and civilians for service to France, People reports. Prior recipients include Clint Eastwood, Robert Redford, Jerry Lewis and Robert De Niro. 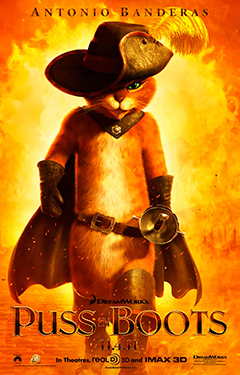 Puss in Boots has pawed its way to the top of the box office for the second week in a row! The animated kiddie flick — featuring the voices of Salma Hayek and Antonio Banderas — raked in $33 million in box office receipts to maintain the top sales spot in its second week in theaters. Eddie Murphy and Ben Stiller‘s caper Tower Heist debuted in second place this weekend, earning $25.1 million in its first week out of the gate. Tower Heist‘s numbers are slightly less than the openings of Stiller’s other comedies, including Meet the Parents ($28.6 million) and Starsky and Hutch ($28.1 million). The holiday-themed A Very Harold & Kumar 3D Christmas opened to disappointing numbers, with an estimated $13.07 million in box office receipts this weekend. The Kal Penn and John Cho-fronted film earned slightly less than the film’s prior installment, Harold & Kumar Escape from Guantanamo Bay, which opened in 2008. Rounding out the top five this weekend were the spooky Paranormal Activity 3 ($8.5 million) and Justin Timberlake‘s sci-fi flick In Time, which earned $7.7 million for a fifth place finish. First-time mom-to-be Beyonce is still jet-setting — for now. On Saturday, the day before her 30th birthday, the “Love on Top” singer emerged in Venice, Italy with husband Jay-Z. Stepping out of their hotel, Beyonce covered up her growing baby bump in a maxi pattern dress as Jay-Z, 41, protectively placed his hand behind her. The duo are in town for the watery, romantic Italian city’s annual film festival — where stars like their close pal Gwyneth Paltrow, Madonna, Matt Damon, Keira Knightley, James Franco, Jessica Chastain, Al Pacino, George Clooney, Salma Hayek and many others are promoting big-time films.